Sound Transit is becoming so huge that its planning activities are practically their own industry. So far this year, the agency’s governing board has approved five office leases totaling $90 million through 2023, and renewable afterward. The latest was a $33 million, four-year deal Thursday to renew the lease on office buildings above the International District/Chinatown Station. This white-collar gold rush is driven by ST3, the voter-approved program to fund eight rail and two bus-rapid transit extensions over the next quarter century. Total staff and consultants will increase from 908 in 2016 to 1,322 in 2018, a 46 percent increase. Thursday’s deal assures space to grow in the 625 Union Station building, where engineering and construction management are based, along with a smaller portion of 605 Union Station. It’s just part of a campus reshuffle for Sound Transit’s growing headquarters staff. Fancier spaces await CEO Peter Rogoff and the senior executives next month in a two-floor remodel of the 705 Union Station building, which overlooks Sodo and commuter-train tracks. 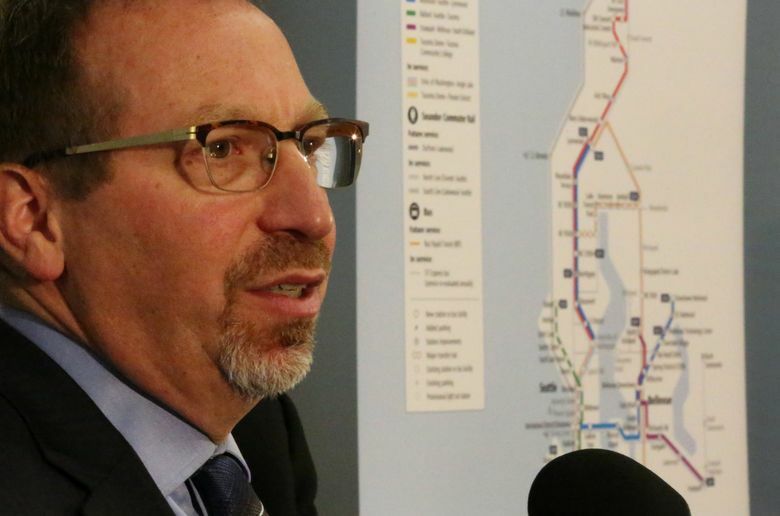 “The entire executive leadership team will be, for the first time, co-located on one floor,” Rogoff told the transit board last month. “We’re trying to de-stovepipe the agency,” Rogoff went on to say. Stovepiping is management jargon to describe a hierarchy where workers report in isolation to separate department heads, hindering collaboration. Some will leave the historic Union Station, built in 1911, while others move in. The entire south-corridor rail design team will consolidate and occupy lower floors of the building. The Seattle area far outspends other U.S. regions to build, operate and maintain public transit supplied by eight agencies, totaling well beyond $500 per person annually in Sound Transit’s taxing district. Rogoff testified to Congress last month that voters’ “self-sacrifice” should be rewarded by a $1.1 billion federal grant to help finance the Northgate-Lynnwood line, which has been stalled by the Trump administration. Sound Transit will collect $2 billion in 2018, according to the agency’s budget. When the $54 billion ST3 is added to projects voters passed in 1996 and 2008, total spending will reach $91 billion through 2041, to serve a projected 700,000 daily passengers. The new leases reflect rising land prices. Transit staff calculate the price at the 625 and 605 Union Station buildings at $35 per square foot per year, in a 47-month renewal starting in 2020. That’s way up from rates that rose $16.75 to $23.50 over 2010-20. However, that $35 is near the blistering market average for prime space, currently $36.47 in the Pioneer Square zone, says quarterly data by the Broderick Group. The agency is saving money by receiving nearly $4 million in “tenant improvement allowances” from landlords, as well as extensive re-use of existing furniture. Kirkland resident Will Knedlik, a longtime critic of the agency’s spending, asked Thursday why Sound Transit doesn’t seek cheaper office space in Tukwila, or even build offices within a future train-maintenance base at the Spring District of northeast Bellevue. “That raises questions about whether Seattle is simply too expensive of a place to have your facilities,” Knedlik said. But Sound Transit says pulling teams together is essential. Even among the neighboring buildings around Union Station, employees say moving between sites and booking limited shared spaces often eats up time, said Patrick. To that end, the remodels add meeting rooms and tables. The ratio of 35 employees per conference room will improve to 25 per room, Patrick said.